At Precision Marine there are two ways Calcium can be added to your reef tank, the Calcium Reactor or the Kalkreactor pictured here. You can either gravity feed through the Kalkreactor from a freshwater top-off system to your reservoir, or use a dosing pump. A reliable water pump is used in lieu of the magnetic stir bar, which tends to jam, bind and wear the acrylic. This model also includes a threaded opening at the top to enable adding Kalk powder without removing the lid. For nearly a decade Precision Marine Systems has been the leader in the trade, creating top-performing, innovative components. Often imitated, but never equaled. Designers of the acclaimed Bullet Series line of foam fractionators, find out why public aquaria, custom installers and retailers alike choose Precision Marine Systems as their premier line of marine filtration. I am giving this 4 stars, I would like to give 5, but it was leaking between the busing and gate valve. I email PM support and was more than helpful. MD also was supportive. It was an easy fix with teflon, but it should be ready to go from start. I installed this on my Reefer 350, inline with a Tunze Osmolator to replenish evaporated water, replacing the gravity feed ATO that came with the tank. 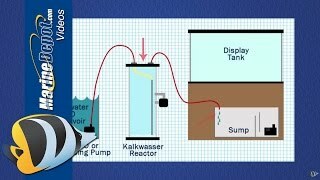 The osmolator feeds water from an RO/DI reservoir into the Kalkreactor when activated and this forces the kalkwasser solution into the sump until the osmolator shuts off. This has been running for over a month and doing a great job automating the process of adding kalkwasser with top off water, while maintaining pH, alkalinity, calcium, and salinity. Coralline algae and corals doing great. This is the best designed Kalkreactor i have ever owned. Others are just too basic and fall apart. Quality!